"What happens after death, to someone who does not choose to stay dead?" Fans of Vincent Price's classic Poe horror films made at American International have long been awaiting their eventual release on DVD. This disc represents the first presentation of one of these Roger Corman AIP classics, and it appears that the wait was worth it. 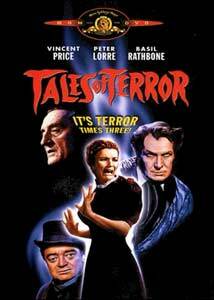 Tales of Terror is one of the earlier entries in the series, and on the whole one of the most faithful to the original Poe stories. It is a trilogy made up of four Poe tales, all of them starring Vincent Price (who also does the linking narration), who had already become inseparably identified with the AIP-Corman-Poe product. Morella, the first and briefest episode, tells of Lenora (Maggie Pierce), who travels to meet her father, Locke (Price), for the first time; ever since her mother, Morella, died, he has lived as "a walking corpse" alone in the house, permanently mourning Morella's memory. In best Poe fashion, he goes so far as to keep her corpse around the house. While nowhere near as ghoulish as Poe's original story, this vignette is an effective and atmospheric little piece. Price chews the scenery a bit at times, but the lush, decayed settings help keep the mood intact. The Black Cat is an amalgamation of the title story and The Cask of Amontillado. This middle segment is darkly humorous, with Peter Lorre playing the incorrigible drunk Montresor. Joyce Jameson is his wife, Helene, who attempts to keep the money away from him lest he drink it all. One night, while crashing a wine merchants' convention, Montresor meets Fortunato (Price), a foppish caricature of a wine taster. Before long, the professional lush takes on the professional taster in a highly comic contest. Unfortunately for Fortunato, he helps Montresor home, where he meets Helene, setting into motion a scheme of revenge and murder. The closing segment, The Case of Mr. Valdemar, features Price as the title character and Basil Rathbone as the mesmerist Carmichael. He has been hypnotizing the gravely ill Valdemar in order to relieve his pain. As the patient is dying, Carmichael puts Valdemar under hypnosis, and suspends him in a state neither alive nor dead. The unearthly sound of Price's voice in this segment is truly unnerving. While Roger Corman has a reputation for quickie films shot on the cheap, all three episodes feature fairly luxurious production design. The special effects are rather unfortunate, since they are uniformly bad; apparently this was clear to Corman as well since they are nearly always covered up by a photographic distortion of some kind. Matheson's screenplay is a decent, if not entirely literal, adaptation of the Poe stories. The interplay of Price and Lorre is quite funny and helps make the central piece highly effective. The blood and gore are quite restrained for the post-Hammer period; while this may be a little intense for the kids, it's not overly gruesome. Image Transfer Review: The reason that the wait was worthwhile is that MGM has seen fit to give this film a new anamorphic transfer! The picture by and large looks gorgeous; no longer need we suffer through the faded yellow prints of this movie that have been circulating on television for years. Blues are excellent (for instance, the blue velvet of Lenora's hat looks absolutely fabulous), and reds and greens are good. Occasionally a red will tend toward oversaturation a little (especially in the Valdemar sequence), but most of the time the reds are accurate and pleasing. Blacks are excellent through most of the film, only occasionally tending a little towards the greenish. A few occasional speckles mar the areas around reel changes, but overall the source print is in excellent condition. I hope that future MGM discs of the AIP library will get this kind of treatment. The fullscreen side of the disc contains an abominable P&S butchery of Corman's careful compositions. The widescreen side is recommended for viewing on all but the tiniest sets. Audio Transfer Review: The original mono track is included. Les Baxter's score occasionally sounds a little on the tinny side, and becomes distorted during the end titles. Dialogue, however, comes through clearly and cleanly, with minimal hiss or noise. As noted above, the voice of Price as Valdemar from beyond the grave is chillingly effective. Extras Review: The only extra is the original theatrical trailer, which manages to give away the climaxes of each of the three segments. Chaptering is adequate, but there are no English subtitles. French and Spanish subtitles are provided, however. Oh, and there are three "fun facts" on the back cover of the case. It makes one long for the days of the "collectible booklet." A very nice movie-only rendition of one of the classic Vincent Price AIP Poe films. This is a good start to the series; I hope MGM will continue to render these films with the care that has gone into this one. Highly recommended.